Pillar was created to address the gender pay gap, as the latest research puts women’s earnings nationwide at 80 percent of men's, and that percentage is even lower in the Midwest. While there are various approaches to closing the pay gap, it is apparent that women need professional support systems in place in order to be their own advocates for equality in the workplace. 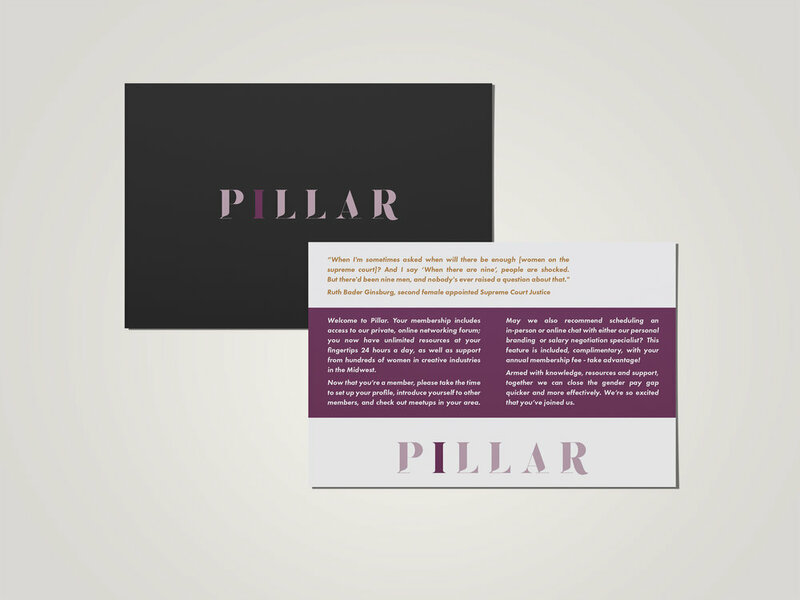 Pillar connects its members with a network of like-minded women with whom to partner throughout their career, as well as provides them with the knowledge and tools necessary to advance not only their careers, but also their salaries, so that the glass ceiling becomes history, not a daily reality. Membership benefits include a private online forum, networking events, salary negotiation and interviewing strategy workshops, resume and personal brand-building guidance, meet-up groups with other members, and access to speakers from prominent members of their field. Studies show that the gender pay gap contributes directly to women’s poverty levels, and if the gap could be closed, working women’s poverty levels in the U.S. could be cut in half. Pillar is envisioned as a purposeful step in closing the gender pay gap. The average pay gap for women living in the Midwest region is worse than the national average. In my home state of Indiana, for example, the pay gap average is 76%. The gap is worse for women of color. Compared with white men, Hispanic or Latina women experience a 54% pay gap, African American women a 63% pay gap. I found inspiration for Pillar from a variety of sources. Strong, female professionals have inspired me throughout my entire life. It was hard to narrow down just five women to illustrate, however, it was important to me that the women featured spanned a wide range of professions, as well as be easily identifiable by today's young women. Women like Ruth Bader Ginsburg and Roxane Gay, the Call Your Girlfriend Podcast ladies (Ann Friedman and Aminatou Sow), Gloria Steinem, bell hooks and Audre Lorde were additional women I drew inspiration from. Access to a private, online, networking forum is one of the greatest membership benefits of joining Pillar. 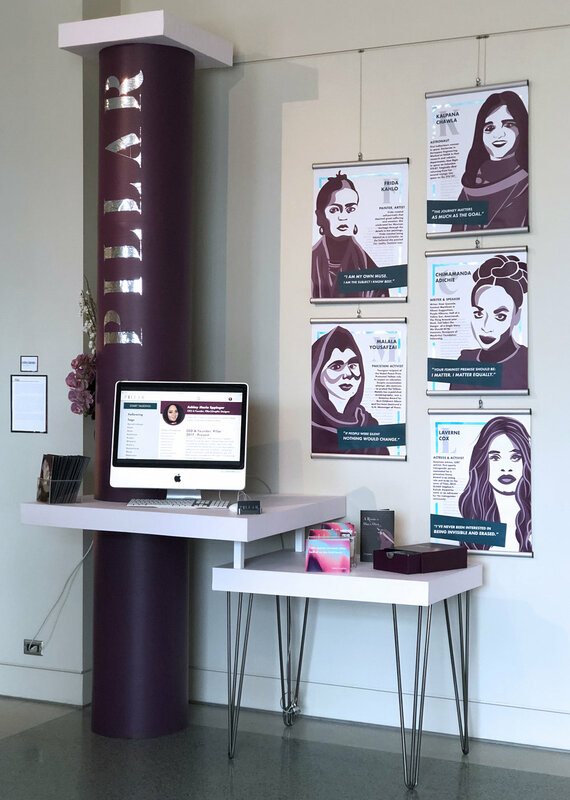 The forum connects women creatives with each other, allowing them to get feedback on projects, post or find jobs, and get involved in Pillar-sponsored or member-arranged meet-ups, events and charity work. See the video below for information about the forum. Members of Pillar receive a Welcome Kit upon signing up for membership. The membership kit was designed and built by me, and includes a copy of A Room of One's Own with an original book jacket, a card wallet and keytag, as well as a postcard book that features illustrations of and quotes by inspiring women. In addition, I designed and constructed an information pamphlet about Pillar and the gender pay gap.